When looking for a new title to write about in my Retro-Review column, I felt like I wanted to revisit the work of one of my absolute favourite DC writers, John Ostrander, but I didn’t really feel like diving into Suicide Squad again, despite it being one of the best comics ever published at DC. Instead, I thought I’d used this as an excuse to fill in the gaps of a series I’d always meant to read in its entirety, which to my knowledge, had never been collected before. That series? 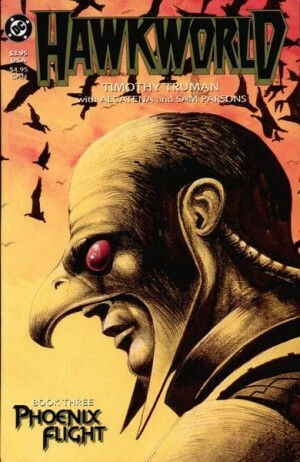 Hawkworld. The only thing is, Ostrander’s series launched out of Timothy Truman’s three-issue Prestige Format book of the same name, so I picked up the last two issues of it (I don’t remember why I only bought the first, but I expect it’s because $5 (Cdn) comics were hard to justify when I was fourteen. I don’t know much about the state of Hawkman in the DC Universe post-Crisis. I know that the late 80s were a time of great reinvention and overhaul at DC, and that this is the period when I was first finding myself attracted to the company. Some brief internet research has left me more confused than ever, and so I’ve decided to give up on trying to figure out how the character was being used (apparently Carter Hall was with the JSA, and Katar Hol was with the JLI briefly), and focus instead on this work. Timothy Truman is a legendary writer and artist. 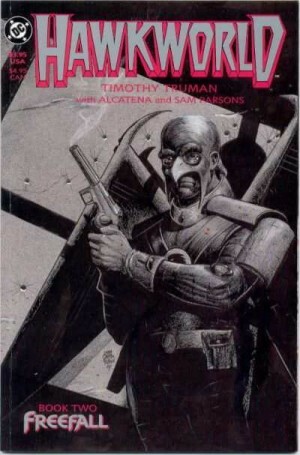 I think I was aware of his work in 1989, but there is the possibility that this is the first Truman comic I read, or at least was the first book where I was consciously aware of his name. He uses this series to reinvent Thanagar. He portrays it as being a world with limited surface area, which has necessitated taking to the skies. People live in gleaming towers, and travel around via wing harness technology. There is a reverence for birds, which is the reason why people use the hawk imagery throughout their culture, especially within their militarized police force. The downside to this lifestyle is Downside, the slums where aliens from a variety of conquered planets and client states barely get by. There is a large servant class that lives in the towers, taken from these same worlds, but they are quickly used up and dumped in the slums. This area is policed heavily by the Wingmen (there are some parallels to American society here). Furthermore, Thanagarian culture is now dependent on manufactured goods and raw materials from conquered worlds. The use of drugs among the upper classes is seen as normal, if not quite legal. Katar Hol, an ensign in the Thanagarian Police Force, The Wingmen, is on a mission, under Commander Byth, and shadowing Captain Kragger, an old hand. They are in Downside to arrest a Thanagarian who apparently knows Byth. When he tries to arrest him, Kragger kills him anyway, since they are in a ‘Flashzone’, making all kills justifiable. There are a variety of children present, who are saved from being killed. We see that Katar keeps thinking about Kalmoran, the now mythological figure who freed Thanagar from its oppressors. Hol finds a weapons cache in the dead man’s apartment. Hol goes to a dinner with his father, the man planet’s chief scientist and the inventor of the winged harnesses, the police commissioner, an administrator, and his daughter, Shayera Thal. The discussion turns to Katar’s interest in history, and then he and Shayera dance, where he talks about his views that Thanagarian society has become too dependent on the servant class, and products brought from other worlds. A waiter bumps into Shayera, and she goes off on him, displaying deeply held racist and speciest viewpoints, which disappoint Katar. The dinner is cut short. Looking for information Downside, Katar and Kragger stop an informant. Others attack them, and Kragger is shot. It looks like someone was paid off by Byth for this. On a remote island, Katar, Shayera, and her father go hunting. The creatures they hunt are brought in from off-planet, and when Shayera kills some, Katar goes to track down one that escaped. He finds it in a cave with its family, where he sees that some cave paintings depict the Thanagarians as cold killers. He leaves his Kalmoran necklace hanging on a statue of his hero. Later, while training, Katar is visited by Byth, who talks to him about having Katar help him put down a conspiracy at the highest levels. At another dinner out, Katar flirts a bit with Shayera after they both apologize for their behaviour while hunting. A suicide bomb explodes, almost killing Katar’s father, and apparently killing Shayera and wounding her father. Byth and Katar move to arrest the traitor who allegedly provided the suicide bomb. While Byth fights a Manhawk, Katar chases a Thanagarian, shoots him, and then discovers that it is his father. Grief-stricken, he goes home and finds a video-journal of his father’s, wherein he discusses having alway helped the Downsiders with medicine and other goods, and how he was going to go meet with a Manhawk to convince him to stop his people from having violence escalate. Katar is arrested for his father’s killing, and is exiled to an island. On the island, he kills an alien who is building a set of wings, only to discover that the wings were being built for him. The alien’s brother becomes his friend, and trains him until his death. After ten years on the island, Katar’s sentence is up, and he is returned to Thanagarian society. He is dropped off in Downside, without wings or anything else of value, to start a new life. He notices that things appear to have changed among the Wingmen, and thinks that he spies Shayera out his window. A few months further on, we learn through some interesting juxtaposition of propaganda and image, that Byth is now running things on Thanagar, as the Administrator of Protection, and that he’s undergone some very strange body modifications that let him have complete control over his shape. In the Downside, we see a business transaction between a Downsider lizard person named Hommy and a smuggler named Jarl. When Jarl tries to learn who Hommy works for, he attacks and threatens him. Hommy leaves with the case he bought. We see the female Hawkman watching him. We learn that Hommy is working for Katar. The officer appears, looking to shut down his operation, but when he gives her a tour, she learns that he is buying medicine to help the ill, and is looking for other ways to improve the lives of the Downsiders. She learns Katar’s name, and leaves. Later, Hommy is attacked by some other Downsiders, part of a rival gang, but is rescued by Katar. The female officer arrives and takes him somewhere in her helicopter. They talk, and she shares what the official record says of Katar’s career. She also tells him what she pieced together – that Byth has orchestrated the funnelling of drugs and weapons Downside, and also arranged to have Katar’s father killed, so he can take over. She reveals that she was one of the children present when Katar went on his first mission Downside, and that later, Administrator Thal adopted her because he looked like his daughter, and named her Shayera Thal. She leaves Katar a set of wings. Katar goes after Byth, and they fight. Byth’s shape-changing abilities make him hard to defeat, but Katar gets the upper hand. Shayera arrives and stops him from killing Byth, who then escapes. Later, we learn that Katar has been reinstated, with backpay that he uses to help Downsiders. He learns that Byth has escaped the planet and gone to Earth, and he vows to follow and capture him. We learn that Shayera is his new partner. 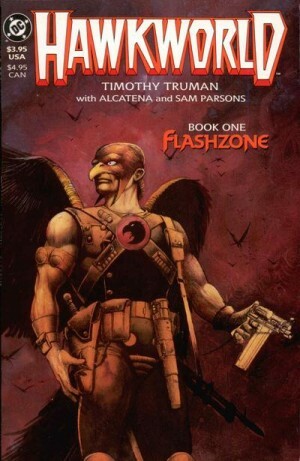 It’s interesting to see how Truman took some familiar tropes about Hawkman – the police officer, and the interest in archeology, historical weapons, and mythology, and upended them by turning him into a bit of a rebellious character. This series is basically an origin story, but by the end of it, neither Katar nor Shayera are superheroes. They are activists and heroes working to improve the lives of an oppressed underclass. That’s an interesting take on these characters. Truman is an amazing artist, and he uses this series to pay homage to the great Joe Kubert, as well as tell his own story. Kubert’s style is all over this book (I suppose the thick hatchings are Enrique Alcatena’s, and not Truman’s), and that helps make the character feel familiar. The designs for the towers and Downside are interesting, as are the variety of alien races that live in the shadows. The entire series feels nice and cohesive, visually. It was interesting to see how Truman approached costume design. When we first see Katar, he’s wearing the militarized police uniform, that has solid wings, and looks like a very military design. On two separate occasions, however, we see him wearing the traditional shirtless with red harness and winged wings look that was the standard throughout the Silver Age. It’s also interesting that this wasn’t remarked upon at all. This was a fresh take on the character, and with Byth escaping to Earth, plenty of room was provided for the ongoing series which launched out of this. Truman stuck around for the first bunch of issues, co-writing with Ostrander, and that’s what we’ll be looking at next time.